When Tony Bennett first heard “Rags to Riches,” he hated the song and was forced by Mitch Miller to record it. 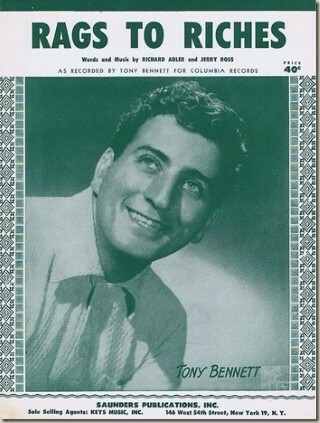 With a very nice arrangement by Percy Faith, the recording was huge hit for Bennett and earned him a gold record. Thankfully, Bennett grew to enjoy singing the song. Martin Scorcese used the 1953 recording in the opening of Goodfellas, which helped find a new audience for this song. “Rags to Riches” was recorded on March 17, 1953; it was released as a single the same year. It was arranged by Percy Faith. “Rags to Riches” was recorded live at Tony Bennett’s concert at Carnegie Hall on June 9, 1962 and was initially released in 1962 on the album Tony Bennett at Carnegie Hall. Ralph Sharon arranged the song. “Rags to Riches” was recorded on August 28, 1962 and released in 2013 on the album Bennett/Brubeck: The White House Sessions Live 1962. “Rags To Riches” was recorded on April 8, 1964 and released in 2011 on Tony Bennett Live at the Sahara: From This Moment On, as part of the 2011 Complete Collection. This is a parody version by Ralph Sharon. “Rags To Riches” was recorded and televised live on April 12, 1994 on MTV. The MTV Unplugged album was released in June of that year. The songs from the televised concert were arranged by Tony Bennett and the Ralph Sharon Trio. “Rags to Riches” was recorded was recorded on February 9, 2006 with Elton John and was released that same year on Duets: An American Classic. It was arranged by Jorge Calandrelli. “Rags to Riches” was recorded in 2012 with Romeo Santos and released on Viva Duets.